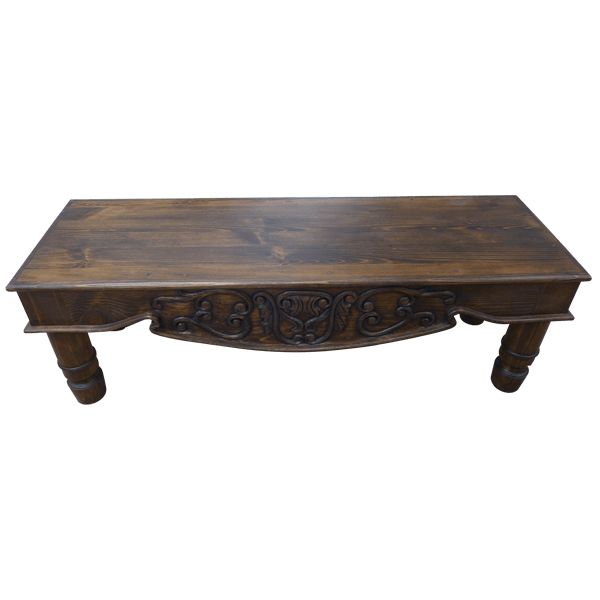 With its versatile design, this luxurious, handcrafted, Western style bench is perfect at the foot of your bed or adorning your entryway. The bench has a wide, rectangular, solid wood seat, and the seat is designed without a back. The front of bench is enhanced with a curved, Spanish colonial style apron, and the apron is embellished with graceful, hand carved, floral designs. The bench rest on elegant, hand turned legs, and it has a beautiful, dark, classic finish. It is made with the best, sustainable, solid wood available, and it is 100% customizable.